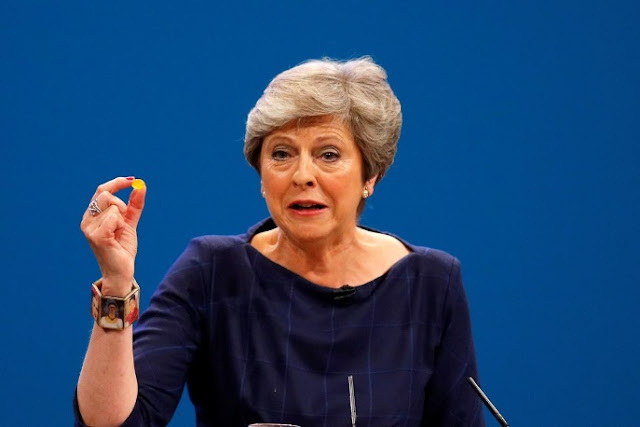 Britain's Prime Minister Theresa May holds up a cough sweet after suffering a coughing fit whilst addressing the Conservative Party conference in Manchester, October 4, 2017. LONDON - British Prime Minister Theresa May showed guts and grace by continuing with her keynote Conservative Party conference speech despite a repeated coughing fit and an interruption by a prankster, business minister Greg Clark told Sky on Thursday. “She showed guts and grace,” Clark told Sky News. He added that there was huge warmth towards May in the conference hall. May’s bid to reassert her dwindling authority was ruined on Wednesday when her keynote speech was interrupted by repeated coughing fits, a prankster, and even letters of her slogan falling off the set behind her. British Prime Minister Theresa May showed guts and grace by continuing with her keynote Conservative Party conference speech despite a repeated coughing fit and an interruption by a prankster, business minister Greg Clark told Sky on Thursday.